Concern is growing globally about water resources and the potential for conflict in regions where they are scarce. But are investors and businesses in Asia adequately factoring water into risk assessments? A recent Neilson study showed that worry about water shortages has overtaken global warming as the top issue, with 75 percent of respondents identifying this as something they worry most about. That represents an increase of 13 percent over the previous year. And the concern is not without basis. Worldwide, almost 1 billion people lack access to safe drinking water while 70 percent of industrial waste in developing nations is dumped untreated into waterways, further limiting what is often already stretched supply. Yet investors and leaders of industry may not be paying attention, considering water challenges simply an environmental problem rather than a fundamental business risk. In China, the water landscape is particularly stark. 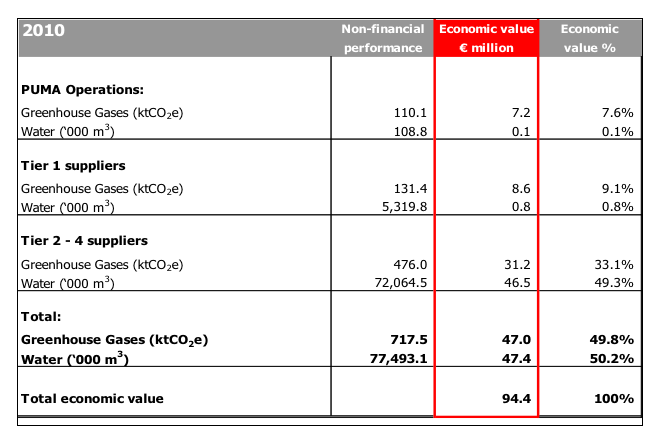 We hear much about that country’s economic growth averaging 10 percent over the past 20 years, the massive and wholesale transformation of the economy at rapid pace, but not so much about the horrendous cost to the environment that already weighs heavily on GDP . We hear much less about the dead and dying rivers, the over-pumped aquifers, the creeping desertification in previously agricultural areas, the thinned soil from over-use of pesticides, the power plants without adequate water to function, the massive and growing health care costs from poisonings and escalating cancer rates. We hear very little about the growing numbers of protests nationwide linked to pollution incidents. The government is clearly concerned. The official response in China has been a tightening regulatory environment, and a move toward real pricing of the precious resource, or the investment opportunities that an inevitable clean up will bring. The recently approved, 12th five-year plan for the first time features climate change and energy, sets lower growth targets for the country and favors investment in industries that promote pollution clean up and cleaner processes generally. Clearly, there are thus significant ramifications across a broad range of industries in China but are investors prepared? Are they staying ahead of the water risk curve, engaging in the due diligence and mitigation efforts needed to survive the inevitable and seismic shifts around water? 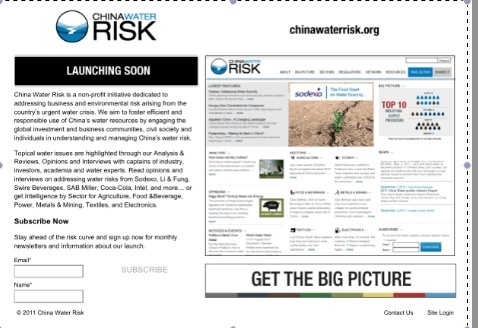 China Water Risk (CWR) is ADMCF’s redesigned follow-on from Asia Water Project, the pilot initiative launched 18 months ago to inform investors and companies of both risk and opportunities around water crisis in China. This initiative, which launches later this month at www.chinawaterrisk.org, is designed to influence capital allocation to industries in China located in water-appropriate regions, with solid mitigation strategies built around water. A brief portrait of water in China tells the back story. Per capita global water resources are 6,280 cubic meters on average but people in China have less than 1/3 of that amount at 1.816 cubic meters. So, the country with 20 percent of the world’s population has access to only 7 percent of global water resources, while an estimated 300 million people in the country are without access to safe drinking water. And this is not just a problem for rural areas in China. In 2007, research showed that 60% of China’s cities faced water scarcity and 110 cities faced serious water shortages. Despite already limited access to water in china, horrendous levels of pollutants are allowed to spill untreated into waterways and seep into aquifers from agriculture and industry in China. Last year, the Ministry of Environmental Protection said serious pollution violations numbered on average 10 every month. In all, an estimated 90 percent of urban groundwater is contaminated with pollutants and the quality of 40 percent of that is getting worse, according to China’s Ministry of Environmental Protection. Pollution of groundwater follows from the low urban sewage treatment rate, which was only 73 percent in 2009, according to a recent article in China Business Times. Hundreds of new sewage treatment plants have been built nationwide in recent years and sit idle because of the high cost of operating them. The Beijing-based Institute for Public & Environmental Affairs in its water pollution map (an inspiration for China Water Risk and a CWR partner) lists hundreds of violations by sewage plants. According to the Ministry of Environmental Protection, 77 percent of 26 key lakes and reservoirs, 43 percent of 7 major river basins are considered unfit for human contact. Meanwhile, 19 percent of monitored rivers and basins, 35 percent of lakes are reservoirs are believed unfit even for agricultural or industrial use. The World Bank has warned of “catastrophic “ consequences for future generations if the government does not act to solve quickly the acute water shortage and pollution problems. The report urged new pricing, management and regulatory strategies. In China, agriculture has been by far the largest consumer of water at 62 percent, and the largest polluter, with pesticides and fertilizers responsible for about half of contamination of waterways. With water scarcity becoming more evident, waterways increasingly unfit for irrigation coupled with the fact that China holds only 7 percent of the world’s arable land, food security has by all accounts become of national concern. Exacerbating the problem, the country is the globally the largest consumer of pesticides and this has contributed heavily not only to aquifer and waterway pollution but to depletion of farmlands. Meanwhile, as environmental and labor regulations tightened in the West pushing up prices at home, Foreign Direct Investment has flooded into China, fueling the factories, building the industry that is now feeding, clothing and housing the world. Last year, FDI was estimated at $105.7 billion, surging 17.4 percent over the previous year. This is also helping build a huge middle class and affluent consumer market in China that is expected to almost triple to 400 million by 2020. According to a September HSBC report, already next year China will replace Japan as the world’s largest consumer of luxury items – something unthinkable just a decade ago. A joint report published in 2007 by the World Bank and the Chinese government estimated the combined health and non-health cost of outdoor air and water pollution at approximately $100 billion a year, or about 5.8% of China’s GDP. Water pollution, meanwhile, worsens China’s severe water scarcity problems, with the overall cost of water shortages estimated at 1% of GDP. The weight on economic growth is certainly of concern to Beijing, but equally concerning is the growing discontent in China related to pollution incidents and scarcity. In 2005, the last year for which government figures have been released, there were an estimated 50,000 protests nationwide related to pollution incidents. This comes in response to significant growth of so-called cancer villages, or clusters of cancers invariably located near heavily polluting factories, fast-growing rates of urban cancers and outbreaks of illness or poisonings related to drinking polluted water. Many of these protests have been centered around specific polluters and in several instances have forced factories or power plants to close. This then involves not just reputational risk but threatens serious economic losses for polluters. There are also additional considerations around political risk. Concern is that as climate change potentially exacerbates the country’s water shortages, the government sees the need to exert further control over domestic water resources with far-reaching consequences. Of the 261 International rivers globally, 15 originate in China, including the Mekong, Ganges, Brahmaputra and Indus rivers. These international rivers span 16 nations and China has no formal agreements or treaties regarding the use of these rivers with any of its neighbors. What is patently clear, is that no investor or business leader can step into China without carefully considering the water challenges facing each industry and then positioning to mitigate risk. At the same time, don’t investors and business leaders want to position themselves to take advantage of potentially huge opportunity?